Mayeux Law is willing and able to handle all aspects of family law. Along with our spotlighted services, our offerings include a complementary suite of legal services, such as paternity and disavowal actions, child support and custody disputes, alimony/spousal support, and community property partitions, ensuring your needs are handled from start to finish for the best outcome. We feel qualified and confident in the following areas. Divorce is the bread-and-butter of Mayeux Law. We understand that divorce happens for a variety of reasons, and therefore we intend to make the process easy and stress-free. We provide a full suite of legal services to address the variety of needs accompanying and as a result of divorce. Getting married is one of the happiest times in your life, so why consult a family lawyer? Take a preemptive step to keep your marriage happy and fair by establishing a prenuptial agreement. 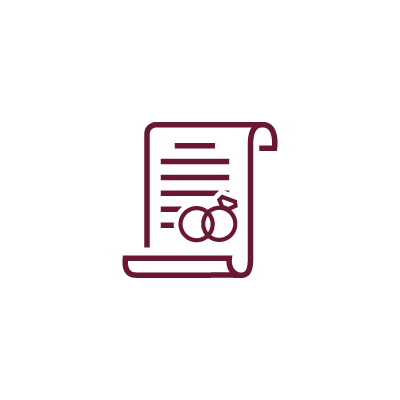 Ranging from a standard agreement to complex assets protection, a prenuptial is the responsible way to say you care about your financial future as a couple and as individuals. As parents and caregivers, you want to make sure your children have the best environment in which to grow and thrive. We’ll help you determine the plan that is in your children’s best interest and move forward to securing their future. Whether this agreement can be resolved amicably between parents or it requires court intervention, we will stand by your side as mediator and advocate. Having an in-house notary public means your legal needs are handled start to finish within Mayeux Law. No extra incurred fees, running paperwork errands, or process delays. Nearly every legal case involves documents that require notary, making this service very valuable to our clients. Mayeux Law exists to address the rising need for a mediator and advocate in tough situations for today’s families. Mayeux Law will help as many clients as possible work out their family issues amicably and smoothly. It’s a tough time, but Mayeux Law aims to take the stress out of legal proceedings for our clients. Let Mayeux Law Help You Start a New Chapter Today. The only way out of a tough situation is through. We’ll get you there with the least stress possible. It starts with just one conversation.